Q1. Can I order you to customize my bike? Q2. Do you stock old bikes using for the custom? A. Tell us what you like, such as model and year. Q3. How much for the complete custom order? A. We arrange and build one with your budget. Q4. I have the engine only. Do you build chassy for it and make one complete bike? Q5. Can I ask you just repairment? Q6. 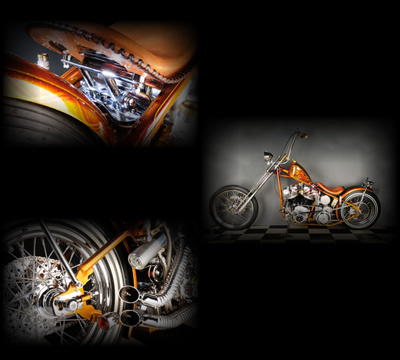 How long does it take to build a complete custom bike? We, MEDICINEMAN CUSTOMS, have been building and fabricating custom motorcycles powered by V-twin engine, and also restoring, repairing and maintenances Harley-Davidson since 1999 in down town of Tokyo. The motorcycle that we make one for you with top quality and high performance will bring you the wonderful and exciting experiences that you have never had before. We are looking forward to building new bike for you, and your excintng moment starts when you contact with us! (C)2004 MEDICINEMAN CUSTOMS All Rights Reserved.